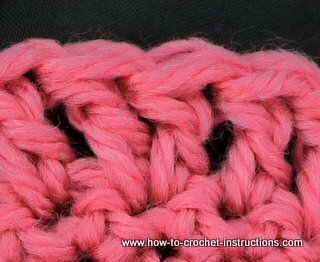 You are a beginner and have mastered the basic crochet stitches, but so far have only been able to work in squares and rectangles. This is great - there are so many things you can make such as scarves, blankets and even jumpers. Now you can go one step further and learn how to decrease and increase your stitches to make other shapes. This will open up a whole new world of possibilites with your designs and the type of patterns you can follow. You will be able to make raglan sleeves, halter tops, shaped hats and berets, gloves, teddies and other toys and much more. 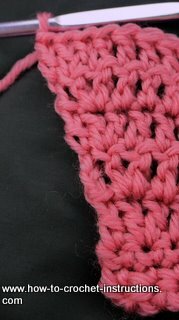 You can also increase to make an L shape by adding a length of chain stitches to the end of a row. Remember to allow extra chains for your turning chain. work back along the chain stitches then continue working along the row. Increasing or decreasing at one side of your work will give a sloping edge. When increasing at the beginning of a row, you can work one of 2 ways. 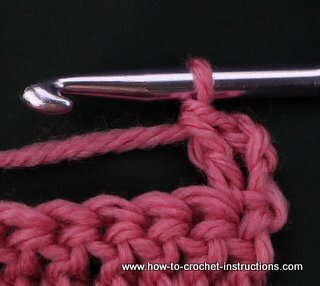 You can either work as you normally would and miss out the first stitch (because the turning chain counts as a stitch), then work two into the next stitch. Alternatively you can simply work into the first stitch and still count the turning chain as a stitch which will give you an extra stitch. See photograph below.